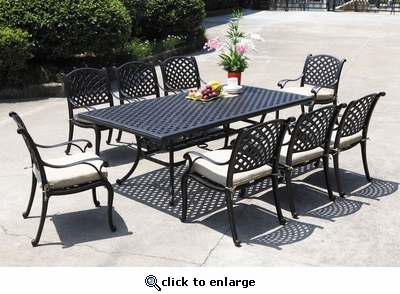 Our matching Lancaster Dining Set are the finest in outdoor entertaining. With its classic cross-weave styling pattern this high quality cast aluminum resembles the look of antique wrought iron. The rich Bronze finished cast aluminum is easy to care for. Table includes umbrella hole with cover.